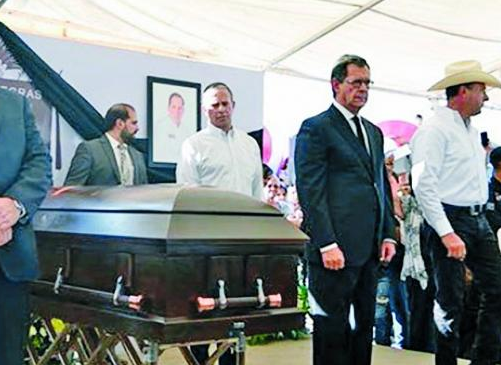 The stunning levels of violence seen in the US’ southern neighbor this year showed no sign of abating after a congressional candidate was assassinated finishing a debate with rival candidates in the Mexican border city of Piedras Negras. The events mark another shadow on the upcoming Presidential and Congressional elections to be held in Mexico next month. Mr. Fernando Purón can be seen in the video after finishing an election debate in the city of Piedras Negras. A man is swirling around calmly in the left corner of the image on the surveillance camera as Mr. Purón accepts the invite of a well-wisher asking to join him for a selfie. As he poses for the picture, the assassin walks up to him from behind and shoots him calmly in the head. Although the motive for the murder remains at this point uncertain, Mr. Purón had received earlier death threats during his time as mayor of the city. At that moment, he regularly had some 10 bodyguards around him at all times and was on a hit list by the city’s dominant crime group, the ruthless Zetas. Mexico goes to the polls on July 1st, with leftist candidate Mr. Lopez Obrador the absolute favorite to become the country’s new president. Prayers to him for holding the light. These good people we want to import to help us make the right decisions during elections? Now we get to see how they handle competition in an election. SAD! Nobody cares. These people aren't white, so they're like toilet paper. The Zetas will pay for this. perfect example of an uncaring baboon. The heroes in Mexico live short lives. This is what happens when the good people are disarmed and the criminals take over. Too many racists in the US. Grow up and look at your own failures. Your Hillary and Obama should be dead. You have no balls.